Dodge has just premiered its No. 7 Fast Five Charger R/T NASCAR racer at the Martinsville Speedway and will be racing it throughout April in numerous events. These will include venues such as the Texas Motor Speedway, Talladega Superspeedway, and the Richmond International Speedway with driver Robby Gordon behind the wheel for all of the races. 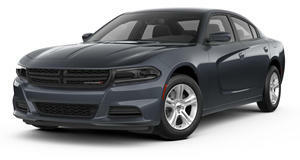 The new car is a part of Dodge&apos;s partnership with Universal Pictures. They are promoting the upcoming fifth installment of "The Fast and the Furious" franchise, "Fast Five." Dodge has also announced that the first 200 who register at speedenergy.com or dodgemotorsports.com or will receive a "Fast Five" movie viewing with Robby Gordon on April 30 in Richmond, Virginia. These winners will also receive a commemorative ticket and photo opportunity with Gordon before the film and will automatically be registered for a grand prize drawing for four VIP credentials to the NASCAR Sprint Cup Series race on April 30. Other prizes included in the grand prize are honorary pit crew member status, and a $200 shopping spree to the Robby Gordon Motorsports souvenir trailer.